The religious history of India is highly diverse and is the birthplace of numerous religions, such as Hinduism, Buddhism, Jainism and Sikhism. Due to this, the country showcases a certain degree of religious tolerance, which plays an integral part in the country's heritage; every citizen of the nation is proud of this diversity. Sacred destinations simply define the confluence of the physical world with the spiritual one, which fills one's heart with divine passion and holiness. These spiritual destinations offer some of the most beautiful and interesting sites, which include more than religious architecture and holy art with a touch of divinity. India is indeed a perfect place for a pilgrimage with its unique and spiritually rich destinations where individuals get the opportunity to wash away their sins and feel the divine power. Located in Morena, inside the Chambal Valley, Chausath Yogini is believed to be one of the rare surviving structures, which are dedicated to the 64 yoginis of Goddess Durga. Inside the temple complex one would come across 64 chambers, apart from the central sanctum, with elaborate carvings of various Hindu deities. Yogini temples have been linked to the tantric beliefs and practices. It also said that the Indian parliament building is built on the lines of this structure which create a magical charm amongst the visitors. 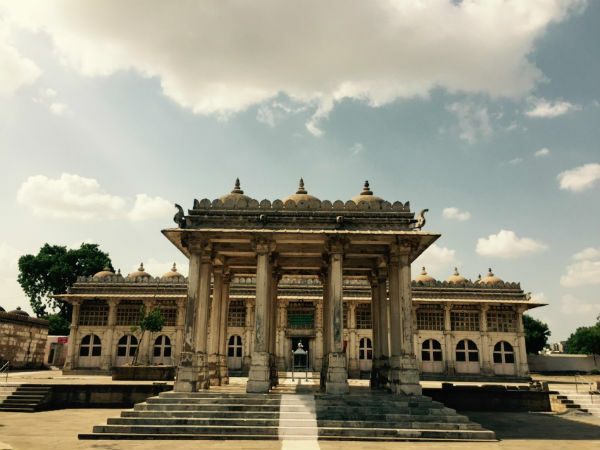 Located in a suburb of Ahmedabad is the Sarkhej Roza, which is home to the tomb of Shaikh Ahmed Khattu Ganj Bakhsh, who was a Sufi saint and advisor to Ahmed Shah I. The saint played an instrumental role in the creation of Ahmedabad. Apart from the tomb, the complex houses a mosque, a library, ruins of old palaces and a cultural centre. The mosque showcases a fine example of Indo-Saracenic style of construction, which also showcases grand lattice works along with Indian and Jain influences. Located in Lonar, the Daitya Sudan Temple was built by the Chalukyas between the 6th and 12th centuries. There are several legends which surround the origins of the shrine; according to one, a demon named Lavanasura used to cause a lot of trouble to the villagers. Lord Vishnu is said to have taken the form of Daitya Sudan to vanquish the asura in the fierce battle where he pounded the demon into the ground so hard that it left behind a huge crater. A drive of four hours from the temple town of Madurai, would take you to a sleepy fishing hamlet of Manapad, which is also a well-known water sports destination of late. However, before this development, the hamlet was a place of religious importance to Christians. The Church of the Holy Cross stands tall painted in white, with the blue sky as a backdrop, which truly creates a beautiful image. In 1540, a Portuguese ship was on its way to the east and was caught in a dangerous storm close to Manapad. The captain prayed for the safety after being battered and washed ashore unhurt. As thanksgiving, he installed a cross built from the original mast of the ship atop a hillock, which drew the attention of St Francis Xavier, who made the hamlet his home, which eventually was declared as the patron saint of the village. Anandpur Sahib is the birthplace of Khalsa and is the dwelling place to the largest encampment of the Nihangs, the blue-robed Sikh warrior class. Established in 1665 by Guru Tegh Bahadur, who was the 9th guru of Sikhism, this hamlet has a large number of gurdwaras and the main amongst them is Kesgarh Sahib, which is one amongst the five major seats of the religion. The grand gurdwara houses several relics of Guru Gobind Singh, which include his personal dagger and much more. Like most other shrines, Kesgarh Sahib is well-maintained and devotees immerse themselves in the singing of devotional songs and in various other spiritual activities. Most of the Tibetan settlements in the country are found around Himachal Pradesh and Sikkim. However, an important settlement in South India was set-up in Bylakuppe, Karnataka. Here, too, one would come across a beautiful monastery which is the major attraction of the second largest Tibetan settlement in the country. It stands above the entire town and is a peaceful sanctuary for a large number of pilgrims, which is filled with thangka paintings and tapestries. In the sanctum one would come across three large golden statues of Buddha along with Padmasambhava and Amitayus.